With reference to my telegram of this day’s date, I have the honour to report that this morning Major Panitza was conducted from his place of confinement in town to the camp of Bali Effendi, close to Sophia, where the troops are quartered for the summer, and in presence of the whole brigade drawn up in military file he was shot by a peloton of twenty-four soldiers. After the execution, Major Marinoff, the Commandant of the Sophia garrison, addressed a short speech to the troops, in which he said that Major Panitza had met his death in just punishment for treason against his Prince and country, and that a similar fate would be dealt out to whosoever should prove a traitor to the interests of the Fatherland. 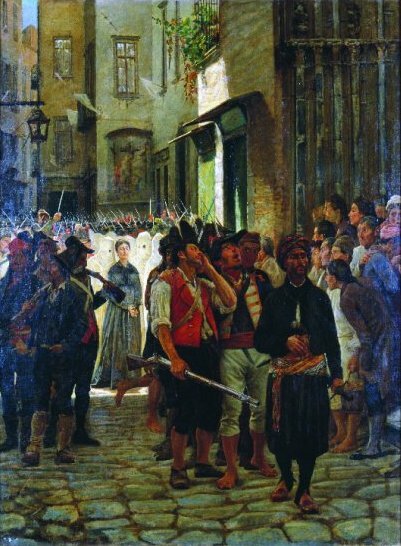 The troops maintained a perfectly impassive attitude throughout the proceedings, and the execution of the condemned in the presence of the garrison shows that the Government wished to make an example which should be a warning to the officers to refrain from the political intrigues that had during the last few years become so prevalent, and that were dangerously undermining the discipline and loyalty of the army. Having recently gained independence by backing its Slavic brethren against its longtime Ottoman master in the Russo-Turkish War, Bulgaria was enjoying all the perquisites of being a minor power pressed between major powers. The leading concern of its able, authoritarian, and justifiably paranoid leader* Stefan Stambolov — “the only Prime Minister in Europe who receives his visitors with a revolver lying next to the ink-stand on his desk,” in the New York Times’ description — was the interest of Bulgaria’s “benefactors” in St. Petersburg in turning this breakaway Ottoman province into an ever more pliant Russian instrument. Whether it was the coreligionists or their coin who inspired it, many in Bulgaria felt sincere loyalty to Russia; in an age of empires, it wouldn’t have been unreasonable statecraft to opt for the security of dependency. With that object in mind, Major Panitza hatched a dangerous plot to overturn the Bulgarian government. His plot conjured an equally dangerous reprisal from Stambolov — who was determined to keep as much independence as Bulgaria could sustain. Many outside of Bulgaria saw statesmanlike quality in Stambolov, but his severe rule exemplified by his unpopular ruthlessness towards Major Panitza made him many enemies at home. Stambolov was himself assassinated shortly after resigning from government in 1895, and his corpse abused en route to its resting place. * Generally transliterated “Stambouloff” or “Stambuloff” during his own lifetime, this gentleman got control of the state by mounting a counter-coup against a Russian putsch. Since the Russians still succeeded in definitively dethroning the sitting Bulgarian king, Stambolov’s hand alone guided the unsteady Bulgarian ship of state for a time. Stambolov eventually installed an Austro-Hungarian noble as Prince Ferdinand I (the two came to hate each other). Later titled “tsar”, Ferdinand was the grandfather of Simeon II, who achieved the unusual distinction of becoming Prime Minister of Bulgaria through democratic election in 2001. ** Panitza’s co-conspirators got various prison terms, including the former Commandant of the Sofia garrison, a gentleman sporting the Strangelovian moniker Lieutenant-Colonel Kissoff. Failed revolutionaries usually wind up as footnotes in history books. Certainly, the period between 1789 (the beginning of the French Revolution) and 1805 (the year in which Napoleon crowned himself emperor) is one of such turmoil in Europe that it is easy not to see any but those who are larger than life. 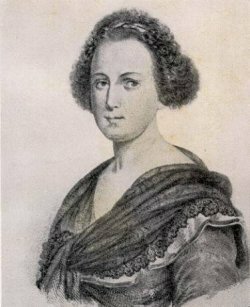 Eleonora Fonseca Pimentel vaulted onto the Naples literary scene as a teenage pop princess with a hit poem for the nuptials of King Ferdinand and Maria Carolina (the latter was Marie Antoinette‘s sister). Pimentel parlayed her puissant pen into a permanent position on the salon circuit, doing late-18th-century literary things like quoting classics and maintaining voluminous correspondences. By the revolutionary 1790’s, she’d risen to become the aforementioned Queen Maria Carolina’s librarian, but was among those inspired by the liberta, egalita, fraternita of the French Revolution. When Napoleon tore through northern Italy and conquered as far as Rome, the monarchy rode out to reconquer the Eternal Cityget itself decimated, and Naples’ dreamers had their chance. Pimentel turned her literary talents to the Republic’s service, including some outstandingly vituperative verse savaging the exiled Maria Caroline as a lesbian and threatening her with the guillotine. Eleonora Fonseca Pimentel is one such overlooked person. She was a major figure, but on a small stage, connected with the little known and failed Neapolitan revolution and subsequent short-lived Neapolitan republic of 1799. It was a sister of the French republic and one of many set up in the 1790s in Europe, all of which—the Neapolitan version included—have been relegated to the status of “also-rans” in history. And stars like leaves before the tempest fly. Certainly, the last days of one of Portugal’s daughters, Eleonora Fonseca Pimentel, seem contained in that verse. to chase away the Jacobins! One of the most interesting memories of the Revolution is the Palazzo Serra di Cassano, on via Monte di Dio. It was the home of Giovanni Serra, Duke of Cassano, one of Eleonora’s closest friends. Looking down at the crowd as he was about to die, he said, “I have always wanted good for them and now they cheer at my death” [cited in Albanese 1998]. The next day, his father closed the portal of the building that opens onto the Royal Palace and said it would remain closed until the ideals his son had died for were realized. The door is still closed. The greatest memorial in recent memory, however, was when Vanessa Redgrave, the English actress, stepped out on the stage of the San Carlo Theater on Friday, January 8, 1999, and recited, in magnificent Italian, the title role in Eleonora, a 3-hour oratorio, an absolute hymn of praise to Eleonora Fonseca Pimentel. It was composed by Roberto de Simone, prominent Neapolitan composer and musicologist. The production had had a two-week run-up in the Neapolitan daily, il Mattino, replete with histories of the Neapolitan revolution, fragments of Eleonora’s poetry, long citations from historical heavyweights such as Benedetto Croce, and even the news that a descendant of Eleonora’s (through her brother’s line), another Fonseca Pimentel, would be at the premiere. The production, itself, was generally well received. The next day, the critic from il Mattino called it “an allegory of all the martyrs in history” (Gargano 1999). “Art is liberty,” he wrote, “and must free itself from the bonds of time like an ever-evolving presepio,” thus comparing the production to the traditional Neapolitan manger scene that celebrates the birth of the Savior. Heady praise, indeed. Visit the Around Naples Encyclopedia for an expanded version of this post with much more about Eleonora Fonseca Pimentel’s biography, the unfolding of the Revolution, and its legacy. Acton, Harold. The Bourbons of Naples. London: Prion Books, 1957. Albanese, Camillo. Cronache di una Rivoluzione, Napoli 1799. Milan: Franco Angeli, 1998. Bradford, Ernle. Nelson, The Essential Hero. London: MacMillan, 1977. Croce, Benedetto. “Eleonora de Fonseca Pimentel.” Monograph. Rome: Tipografia nazionale, 1887. Croce, Benedetto , et al. La Rivoluzione Napoletana. 1999 reprint by Tullio Pironti, ed. Naples: Morano, 1899. Croce, Benedetto. “Eleonora de Fonseca Pimentel e il Monitore Napoletano” in La Rivoluzione Napoletana di 1799. Bari: Laterza, 1926. Cuoco, Vincenzo. Saggio Storico sulla Rivoluzione Napoletana nel 1799. Milano: 1806. Diana, Rosario. Forward to Vincenzo Cuoco, Pl atone in Italia. Naples: Pagano, 2000. Gargano, Pietro. “Quei martiri nostri fratelli.” Il Mattino, January 9, 1999. Gurgo, Bice. Eleonora Fonseca Pimentel. Napoli: Cooperativa Libreria, 1935. Irace, Clorinda. E.F.P. Le tracce, i luoghi. Naples: Lions Club, 1977. Macciocchi, Maria Antonietta. Cara Eleonora. Milan: Biblioteca Universale Rizzoli, 1993. Stendahl. Rome, Florence and Naples. 1826. (Richard N. Coe, trans.) London: John Calder, 1959. Urgnani, Elena. La Vicenda Letteraria e Politica di Eleonora de Fonseca Pimentel. Il Pensiero e la storia. Ed. Istituto Italiano per gli Studi Filosofici. Vol. 54. Naples: La Città del Sole, 1998.